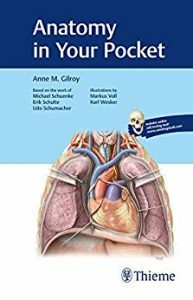 Anatomy in Your Pocket by Anne Gilroy is based on the award-winning textbook Atlas of Anatomy and the work of Michael Schuenke, Erik Schulte, and Udo Schumacher. This volume is organized by seven sections: the back, thorax, abdomen, pelvis, upper limb, lower limb, and head and neck. Each card features a full-color illustration with numerical labels only, while the reverse side provides the answers, an ideal format for self-testing. First-year medical students studying gross anatomy and second-year medical students preparing for the USMLE® Step 1 or COMLEX will benefit from using this resource as a study companion. It is also a go-to anatomical reference for other medical trainees who need a succinct yet thorough review of key anatomy. Anne M. Gilroy, MA, is Professor, Department of Radiology, University of Massachusetts Medical School, Worcester, Massachusetts, USA. She is the co-author of Thieme’s renowned Atlas of Anatomy as well as Anatomy: An Essential Text.